Curling Stones for Lego People: My Crazy Life... All the B's! 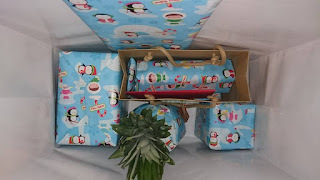 This week I've been a Secret Santa - well once I found a pineapple (it's a cocktail thing) and as my partner lived nearby I turned up in person complete with a Santa Hat with bells on, well once I'd found out where she'd moved to... I did say it was chaotic didn't I? So glad she was in; I could never have got that pineapple through the letterbox! My Secret Santa lives in France, and after a chaotic week at work (hunting pineapples in strange cities before meetings), it was just the best thing to sit down and open a whole host of very carefully selected goodies - my partner knows me so well! Lucky spoilt me received the recent glass Halloween Bead - Trick or Treat, and the new Love Dragon which is clutching a little heart. I love asymmetric beads, so the dragon has found a very happy home here with me and I can't wait to incorporate the glass onto a bracelet for next year. *although my Secret Santa lives in France, she shared with me that she bought my beads in Italy and it's their fabulous packaging; so my apologies to the Italian retailers... it's your packaging that ROCKS!! I've been very naughty with my bead buying, I think I lost sight of my budget at the back end of the Summer - I've actually forgotten what I've told you all about and what I haven't! There was a glut of artisan beads, both glass and silver, from some of my favourite designers and some newly discovered artists too. 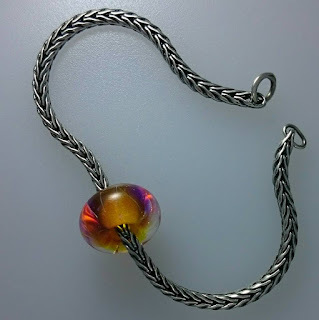 Brand wise there's been Elfbeads, X Jewellery, Story, the fabulous new Black Friday beads from Trollbeads (Midnight Brilliance) and quite a few preloved Trollbeads stones and the odd chain thrown in for good measure. Some of the new beads that have made it onto a bangle! ...because I've been making too many beads that have found their way into her hands. I'm really enjoying playing with glass; currently I'm learning how to finish my beads by manually lining them with silver tubing in one solid core, rather than gluing in two end caps. I think I actually held my breath when I cored this one, as it was one of my favourites out of the last big batch of beads I made. Erm, I must confess I've lost a few beads along the way whilst I'm practising. I'm away with work and quite busy in general at the moment, so poor old Curling Stones for Lego People is having to take a bit of a backseat at the moment. So please know it's not a lack of interest on my part, as I love writing and chatting with you all - it's just that my daily life is getting a little too chaotic to keep to a regular writing schedule at the moment... but there will always be something to read at least once a month! Even if that is how busy I am! 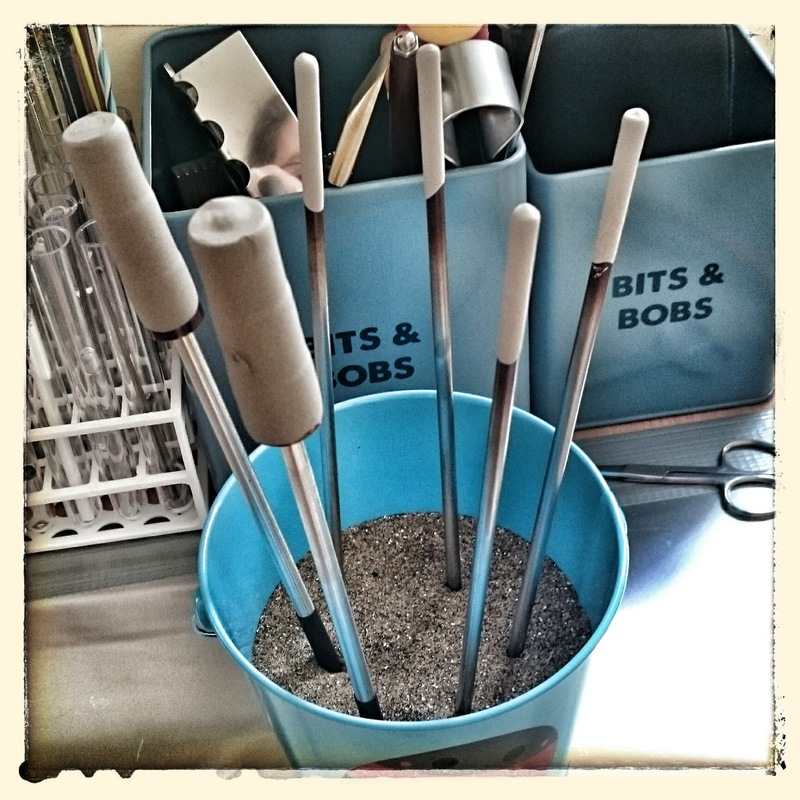 Would you like to know more about my journey with making beads? I would definitely like to know more about your journey with making beads! I find it very interesting :) And I don't think that you should be shy about showing your beads, I have thought the ones that you've shown so far have been great. Although I understand; I'm sometimes shy about showing mine. I shall make a start then... when I can find more than 5 mins! It's fun to look back at what I was making back in March when I started compared to now, definitely can see a progression these days :) Although my speciality is still a lovely wonky bead! Your latest bead creation looks great Mars, I would love to see more! :-D I've been going crazy buying beads too lately, too hard to resist with all the deals! I know, the deals, they burn my eyes and bank balance!! I think I'm still on for making my New Year's Bead Resolutions of a sort... but I do need to do some adding up as I'm not totally sure if I have or not! But the amount I have waiting to even be put away, prior to playing is ridiculous! As I said to Tracy above, I shall put some stories up in the comming months then about my own beads, as in the ones I make... I shall be writing about the ones I buy too - I just need to invent a real life TARDIS so I can create some more time to do all the things I want to do. Yes, the bead shown above is gorgeous! And I agree with the Trollbeads packaging from France, how lovely! The French packaging is just lush, even the tissue paper was the good stuff! Just had to update the blog, apparently my fabulous packaging is from Italy not France... my Secret Santa had been globetrotting! Just been uploading photos to the laptop as been a bit remiss lately so think I can oblige you all once I've had lots of sleep and a rest!